For other people named Tim Cook, see Tim Cook (disambiguation). Timothy Donald Cook (born November 1, 1960) is an American business executive and industrial engineer. Cook is the chief executive officer of Apple Inc., and previously served as the company's chief operating officer under its cofounder Steve Jobs. Cook joined Apple in March 1998 as a senior vice president for worldwide operations, and then served as the executive vice president for worldwide sales and operations. He was made the chief executive on August 24, 2011, prior to Jobs' death in October of that year. During his tenure as the chief executive, he has advocated for the political reformation of international and domestic surveillance, cybersecurity, corporate taxation, American manufacturing, and environmental preservation. Cook was born in Mobile, Alabama, United States. He was baptized in a Baptist church and grew up in nearby Robertsdale. His father, Donald, was a shipyard worker, and his mother, Geraldine, worked at a pharmacy. Cook graduated from Robertsdale High School. He earned a Bachelor of Science (B.S.) in industrial engineering from Auburn University in 1982, and his Master of Business Administration (MBA) from Duke University's Fuqua School of Business in 1988. After graduating from Auburn University in 1982, Cook spent 12 years in IBM's personal computer business, ultimately serving as the director of North American fulfillment. It was during this time that Cook also earned his MBA from Duke University, becoming a Fuqua Scholar in 1988. Later, he served as the Chief Operating Officer of the computer reseller division of Intelligent Electronics, and in 1997 became the Vice President for Corporate Materials at Compaq for six months. Any purely rational consideration of cost and benefits lined up in Compaq's favor, and the people who knew me best advised me to stay at Compaq... On that day in early 1998 I listened to my intuition, not the left side of my brain or for that matter even the people who knew me best... no more than five minutes into my initial interview with Steve, I wanted to throw caution and logic to the wind and join Apple. My intuition already knew that joining Apple was a once in a lifetime opportunity to work for the creative genius, and to be on the executive team that could resurrect a great American company. His first position was Senior Vice President for worldwide operations. In relation to the role, Cook was quoted as saying: "You kind of want to manage it like you're in the dairy business. If it gets past its freshness date, you have a problem". Cook closed factories and warehouses, and replaced them with contract manufacturers; this resulted in a reduction of the company's inventory from months to days. Predicting its importance, his group invested in long-term deals such as advance investment in flash memory from 2005 onward, guaranteeing stable supply of what became a key iPod Nano, then iPhone and iPad component. Competitors at Hewlett-Packard, describing their cancelled TouchPad tablet computer, later said that it was made from "cast-off reject iPad parts". Cook's actions were credited with keeping costs under control and, combined with the company's design and marketing savvy, generated huge profits. In January 2007, Cook was promoted to lead operations and served as chief executive in 2009, while Jobs was away on a leave of absence for health related issues. In January 2011, Apple's board of directors approved a third medical leave of absence requested by Jobs. During that time, Cook was responsible for most of Apple's day-to-day operations, while Jobs made most major decisions. After Jobs resigned as CEO and became chairman of the board, Cook was named the new chief executive officer of Apple Inc. on August 24, 2011. Six weeks later, on October 5, 2011, Jobs died due to complications from pancreatic cancer. Forbes contributor Robin Ferracone wrote in September 2011: "Jobs and Cook proceeded to forge a strong partnership, and rescued the company from its death spiral, which took it from $11 billion in revenue in 1995 down to less than $6 billion in 1998 ... Under their leadership, the company went from its nadir to a remarkable $100 billion today". [better source needed] In April 2012, Time included Cook on its annual "100 Most Influential People in the World" list. On October 29, 2012, Cook made major changes to the company's executive team. Scott Forstall resigned as senior vice president of iOS, and became an advisor to Cook until he eventually departed from the company in 2013. John Browett, who was Senior VP of retail, was dismissed six months after he commenced at Apple, when he received 100,000 shares worth US$60 million. Forstall's duties were divided among four other Apple executives: design SVP Sir Jonathan Ive assumed leadership of Apple's human interface team; Craig Federighi became the new head of iOS software engineering; services chief Eddy Cue became responsible for Maps and Siri; and Bob Mansfield, previously SVP of hardware engineering, became the head of a new technology group. Cook's executive changes occurred after the third quarter of the fiscal year, when revenues and profits grew less than predicted. One commentator said that Forstall was forced to step down, as Cook "decided to lance the boil as internal politics and dissent reached a key pitch". Since becoming CEO, Cook focused upon building a harmonious culture that meant "weeding out people with disagreeable personalities—people Jobs tolerated and even held close, like Forstall"; although, another journalist said that "Apple's ability to innovate came from tension and disagreement." On February 28, 2014, Cook made headlines when he challenged shareholders to "get out of the stock" if they didn't share the company's views on sustainability and climate change. 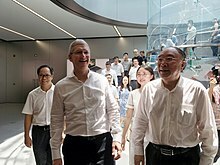 In May 2016, Cook traveled to China to meet with government officials there after the closure of Apple's online iTunes Store and Apple Books store by the Chinese government. In 2016, some analysts compared Cook to former Microsoft CEO Steve Ballmer, claiming that innovation had died down since he replaced Jobs, similar to when Ballmer became Microsoft CEO in 2000. In December 2017, Cook was a speaker at the World Internet Conference in China, where he stated that "the theme of this conference—developing a digital economy for openness and shared benefits—is a vision we at Apple share. We are proud to have worked alongside many of our partners in China to help build a community that will join a common future in cyberspace." Research published at the University of Oxford characterised Cook's leadership style as paradigmatic of founder centrism: explained as a founder's mindset, an ethical disposition towards the shareholder collective, and an intense focus on exponential value creation. Following the December 2015 terrorist attack in San Bernardino, California, in which 14 people were killed by Rizwan Farook and Tashfeen Malik, the Federal Bureau of Investigation solicited Apple to assist in "unlock[ing]" an iPhone 5C used by Farook. On February 16, 2016, in response to a request by the Department of Justice, a federal magistrate judge ordered Apple to create a custom iOS firmware version that would allow investigators to circumvent the phone's security features. Cook responded in an open letter, wherein he denounced the government's demands as constituting a "breach of privacy" with "chilling" consequences. As Apple Inc. CEO, Cook regularly begins sending emails at 4:30 a.m. and previously held Sunday-night staff meetings by telephone to prepare for the next week. Cook shared in May 2013 that his leadership focused on people, strategy, and execution; he explained, "If you get those three right the world is a great place." Under Cook's leadership, Apple has increased its donations to charity, and in 2013, he hired Lisa Jackson, formerly the head of the Environmental Protection Agency, to assist Apple with the development of its renewable energy activities. During the 2008 election cycle, Cook donated to Barack Obama's first White House election. While it had been reported in early 2011 that Cook was gay, at the time, and prior to his Oct. 2014 public statement, Cook chose to keep his personal life private. He did publicly support LGBT rights. In October 2014, the Alabama Academy of Honor inducted Cook, who spoke about his home state's record of lesbian, gay, bisexual, and transgender rights. The Academy of Honor is the highest honor Alabama gives its citizens. In early March 2016, he donated to the election campaign of Democratic representative Zoe Lofgren of California. In early June, Cook hosted a private fundraiser along with Speaker of the U.S. House of Representatives Paul Ryan, described by Politico as "a joint fundraising committee aimed at helping to elect other House Republicans". In the 2016 election, Cook raised funds for the presidential campaign of Hillary Clinton. At one point, Clinton's campaign considered Cook as a candidate for vice-president. In September 2017 at Bloomberg's Global Business Forum, Cook defended the DACA immigration program. He expressed his dissatisfaction with the direction of Donald Trump's administration, stating: "This is unacceptable. This is not who we are as a country. I am personally shocked that there is even a discussion of this." Cook is a fitness enthusiast and enjoys hiking, cycling, and going to the gym. Cook is known for being mostly solitary. He uses an off-campus fitness center for privacy, and very little is known about his personal life. He explained in October 2014 that he has sought to achieve a "basic level of privacy". Cook was misdiagnosed with multiple sclerosis in 1996, an incident he said made him "see the world in a different way". He has since taken part in charity fundraising, such as cycle races to raise money for the disease. Cook later told an Auburn alumni magazine that his symptoms came from "lugging a lot of incredibly heavy luggage around". In 2009, Cook said that he offered a portion of his liver to Jobs, since both share a rare blood type. Cook said that Jobs responded by yelling, "I'll never let you do that. I'll never do that." On October 30, 2014, Cook came out as gay and stated in an editorial for Bloomberg Business, "I'm proud to be gay, and I consider being gay among the greatest gifts God has given me." Cook also explained that he has been open about his sexuality "for years" and, while many people at Apple were aware of his sexual orientation, he sought to focus on Apple's products and customers rather than his personal life. He ended the article by saying "We pave the sunlit path toward justice together, brick by brick. This is my brick." As a result, Cook became the first openly gay CEO on the Fortune 500 list. In September 2015, Cook appeared on The Late Show with Stephen Colbert; when asked about what inspired him to publicly reveal his sexual orientation, he responded, "Where I valued my privacy significantly, I felt that I was valuing it too far above what I could do for other people, so I wanted to tell everyone my truth." According to Forbes, Cook signed the Giving Pledge, a decision that was revealed in March 2015 during an interview with Fortune Magazine. His decision to donate the majority of his money to charity joins notable billionaires like Bill Gates and Warren Buffett, the founders of the Giving Pledge. ^ "DEF 14A". SEC. February 26, 2016. ^ Cowley, Stacey (August 26, 2011). "Apple gives Tim Cook $384 million stock grant". [CNN]. Retrieved February 5, 2019. ^ Brownlee, John (August 25, 2011). "Who Is Apple's New CEO Tim Cook? [Bio]". Cult of Mac. Retrieved November 13, 2017. ^ Cotton, Katie; Dowling, Steve (August 25, 2011). "Steve Jobs Resigns as CEO of Apple: Tim Cook Named CEO and Jobs Elected Chairman of the Board" (Press release). Apple Inc. Retrieved November 13, 2017. ^ a b c "Tim Cook". Forbes. Retrieved November 13, 2017. ^ a b "Investor Relations – Investors – Corporate Governance". Nike, Inc. Retrieved November 13, 2017. ^ "Apple's Tim Cook Is First Fortune 500 to Come Out as Gay". NBCNews.com. October 30, 2014. ^ "NFF Board Member Tim Cook Named CEO of Apple". National Football Foundation. August 25, 2011. ^ "Tim Cook B'88". Duke University. Retrieved November 13, 2017. ^ "Tim Cook plans to donate $800m fortune to charity before he dies". ^ a b Michael Finch II: Tim Cook – Apple CEO and Robertsdale's favorite son – still finds time to return to his Baldwin County roots. AL.com, February 24, 2014. ^ Weinberger, Matt. "The rise of Apple CEO Tim Cook, the leader of the first $1 trillion company in the US". Business Insider. ^ Cook, Tim (March 29, 2016). "Tim Cook: Pro-discrimination 'religious freedom' laws are dangerous". The Washington Post. Retrieved November 27, 2016. ^ "Tim Cook – Apple CEO and Robertsdale's favorite son – still finds time to return to his Baldwin County roots". AL.com. ^ Love, Julia (January 14, 2009). "Fuqua grad takes reins at Apple". The Chronicle (Duke University). Retrieved February 11, 2011. ^ "The genius of Steve". CNN. August 24, 2011. Retrieved October 4, 2013. ^ Cook, Tim. "Commencement Address at Auburn University, 20110". Fast Co Design. ^ a b c Lashinsky, Adam (November 10, 2008). "The genius behind Steve". CNN. Retrieved May 25, 2010. ^ Ziegler, Chris. "Pre to postmortem: the inside story of the death of Palm and webOS". The Verge. Retrieved September 11, 2014. ^ Lashinsky, Adam (November 10, 2008). "The genius behind Steve". CNN. ^ Helft, Miguel (January 23, 2011). "The Understudy Takes the Stage at Apple". The New York Times. Retrieved February 11, 2011. ^ "Apple boss Steve Jobs takes 'medical leave'". BBC News. January 17, 2011. Retrieved February 11, 2011. ^ a b Robin Ferracone (September 13, 2011). "An Outsider's View of Apple's Succession Plan". Forbes.com. Forbes LLC. Retrieved August 25, 2014. ^ "Steve Jobs resigns from Apple, Cook becomes CEO". Reuters. August 24, 2011. Retrieved August 24, 2011. ^ Wingfield, Nick (October 16, 2006). "Apple's no. 2 has low profile, high impact". The Wall Street Journal. Retrieved October 16, 2006. ^ Gore, Al (April 12, 2012). "The 100 Most Influential People in the World". Time. Archived from the original on January 2, 2019. Retrieved August 15, 2012. ^ Heath, Alex (April 25, 2012). "Apple Welcomes New Retail VP John Browett With $60 Million In Stock". Cult Of Mac. Archived from the original on May 13, 2013. Retrieved May 2, 2013. ^ "Apple Announces Changes to Increase Collaboration Across Hardware, Software & Services". Apple Inc. October 29, 2012. Retrieved October 29, 2012. ^ Arthur, Charles (October 30, 2012). "Apple's Tim Cook shows ruthless streak in firing maps and retail executives". The Guardian. London. ^ Jay Yarow (November 12, 2012). "Fired Apple Executive Scott Forstall 'Was The Best Approximation Of Steve Jobs That Apple Had Left'". Business Insider. Retrieved May 2, 2013. ^ "Apple's Tim Cook picks a fight with climate change deniers". CNN. March 1, 2014. Retrieved March 1, 2014. ^ Vincent, James (May 6, 2016). "Tim Cook reportedly traveling to China following closure of Apple's online stores". The Verge. Retrieved November 27, 2016. ^ Lynch, Jim. "Apple: Is Tim Cook turning into Steve Ballmer?". ^ Liao, Shannon (December 4, 2017). "Apple's Tim Cook and Google's Sundar Pichai were surprise guests at China's internet conference". The Verge. Retrieved December 5, 2017. ^ Horwitz, Josh (December 4, 2017). "Tim Cook and Sundar Pichai's surprise remarks at China's "open internet" conference". QZ. Retrieved December 5, 2017. ^ Garside, Juliette (August 9, 2013). "Apple, Google and AT&T meet Obama to discuss NSA surveillance concerns". The Guardian. Retrieved August 12, 2013. ^ Romm, Tony (August 8, 2013). "Apple's Tim Cook, tech executives meet with Barack Obama to talk surveillance". Politico. Archived from the original on February 3, 2019. Retrieved August 12, 2013. ^ a b Lichtblau, Eric; Benner, Katie (February 17, 2016). "Apple Fights Order to Unlock San Bernardino Gunman's iPhone". The New York Times. Washington, D.C. Retrieved February 21, 2016. ^ Farivar, Cyrus (February 16, 2016). "Judge: Apple must help FBI unlock San Bernardino shooter's iPhone". Ars Technica. Condé Nast. Archived from the original on February 17, 2016. Retrieved February 21, 2016. ^ Cook, Tim (February 16, 2016). "A Message to Our Customers". Apple Inc. Archived from the original on February 17, 2016. Retrieved February 21, 2016. ^ "Apple CEO and Fuqua Alum Tim Cook Talks Leadership at Duke". The Fuqua School of Business, Duke University. May 29, 2013. ^ Patel, Nilay. "Tim Cook boasts about Apple's charitable contributions during internal all-hands meeting". The Verge. Retrieved May 21, 2013. ^ "Apple's softer side emerges under Cook". 3 News NZ. December 10, 2012. ^ a b Walter Smyth (March 2, 2014). "Tim Cook Coming Into His Own". Mobility Digest. Mobility Digest. Retrieved August 25, 2014. ^ "Almost All Tech Execs At White House Supported Obama Campaign". NPR.org. Retrieved June 21, 2016. ^ "Meet Apple's New Boss, The Most Powerful Gay Man in Silicon Valley". Gawker. January 20, 2011. Retrieved November 1, 2014. ^ "Apple's Newest Product: Gay iCon?". advocate.com. October 19, 2011. Retrieved November 1, 2014. ^ "Tim Cook's memo takes public battle for gay rights to his employees". upstart.bizjournals.com/. December 23, 2013. Retrieved November 1, 2014. The traditionally reserved CEO kicked off this recent burst of public statements in support of the rights of the LGBT community with an op-ed in the Wall Street Journal urging Congress to pass the Employment Nondiscrimination Act (ENDA) protecting employees against discrimination in the workplace. ^ "Apple's Tim Cook Calls on Alabama to Protect Gay Rights". The New York Times. Associated Press. October 27, 2014. Retrieved October 30, 2014. ^ Isaac, Mike (October 30, 2014). "Long Private About the Topic, Tim Cook Says He's 'Proud to Be Gay'". The New York Times. Retrieved October 30, 2014. ^ a b c Romm, Tony (June 20, 2016). "Apple's Cook to host Paul Ryan fundraiser amid Trump woes". Politico. Archived from the original on June 21, 2016. Retrieved June 21, 2016. ^ Pressman, Aaron (August 24, 2016). "Apple CEO Tim Cook Is Hosting a Fundraiser for Hillary Clinton". www.fortune.com. Fortune. Retrieved September 3, 2017. ^ Leswing, Kif (October 18, 2016). "Hillary Clinton's campaign considered Apple CEO Tim Cook for vice president". Business Insider. Archived from the original on October 25, 2016. Retrieved September 3, 2017. ^ "CEO Tim Cook says Apple is pushing extremely hard on DACA: 'I am personally shocked that there is even a discussion of this'". CNBC. Retrieved October 8, 2017. ^ "Tim Cook says DACA is the 'biggest issue of our time'". Recode. Retrieved October 8, 2017. ^ Kane, Yukari. "The Job After Steve Jobs: Tim Cook and Apple". Wall Street Journal. Retrieved September 11, 2014. ^ Auburn University Spring 2010 Commencement Speaker Tim Cook. Auburn University. May 14, 2010. Retrieved August 27, 2011. ^ a b "Bloomberg - Are you a robot?". www.bloomberg.com. ^ Husock, Howard. "Tim Cook's $800 Million Giving Pledge: Why It's So Important". Forbes. ^ "Person of the Year: Tim Cook of Apple - FT.com". Retrieved July 7, 2016. ^ Hall, Zac (December 11, 2014). "Financial Times names Tim Cook 'Person of the Year'". 9to5Mac. Retrieved July 9, 2016. ^ "Financial Times on Twitter". Retrieved July 9, 2016. ^ Chmielewski, Dawn (November 30, 2015). "Apple CEO Tim Cook to Receive Robert F. Kennedy Center Award". Recode. Retrieved June 25, 2016. ^ Rossignol, Joe. "Tim Cook Accepts 2015 Ripple of Hope Award at RFK Center for Justice and Human Rights". Retrieved July 9, 2016. ^ "Tim Cook". Fortune. Retrieved October 19, 2015. ^ "Fortune's ranking of the 'World's Greatest Leaders' is nearly half women". Washington Post. Retrieved July 9, 2016. ^ "Apple's Tim Cook accepts Visibility Award at Human Rights Campaign dinner". AppleInsider. Retrieved July 7, 2016. ^ Campaign, Human Rights. "Apple CEO Tim Cook To Be Honored at the 19th Annual Human Rights Campaign National Dinner | Human Rights Campaign". Human Rights Campaign. Retrieved July 9, 2016. ^ "Apple CEO Tim Cook receives honorary Doctorate of Science". University of Glasgow. Retrieved January 10, 2019. ^ Feiner, Lauren (December 4, 2018). "Apple CEO Tim Cook, at ADL, says hate has no place on tech platforms". www.cnbc.com. Retrieved January 12, 2019. Wikimedia Commons has media related to Tim Cook.